[CONSTITUTION]. Magazine. 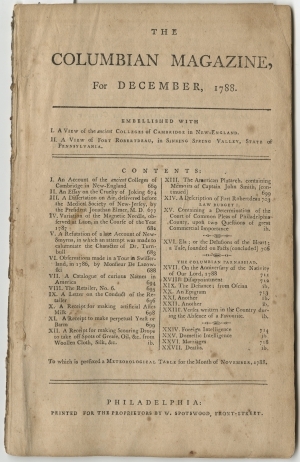 The Columbian Magazine, Philadelphia, Pa., December, 1788. 52 pp., 5 x 8 in. Lacking plates. This title has the honor of being the first successful American magazine, having begun in September 1786 and lasting until December 1792. Although many titles existed earlier, none enjoyed the success of lasting beyond a few issues or a couple of years. Opens with five pages on “An Account of the Ancient Colleges at Cambridge in New England...” that being Harvard University. (pp. 669-673). A recipe for making artificial Asses milk (p. 698). With “The American Plutarch - Memoirs of Captain John Smith” (pp. 699-703, continued for a previous issue and concluded in the next). “a new convention be recommended for the purpose of reconsidering the new constitution held out by the federal convention as a government for the United States.” (p. 716). With a “List of Senators of the United States Already Chosen” by state (pp. 717-718). Also mention of the officers for the Masonic Lodge at Philadelphia (p. 716).